LIKE other countries, China has bureaucratic infighting. But it does better than most at keeping tussles hidden from outside view, especially under Xi Jinping, a president who brooks no dissent. So it has been highly unusual to see a spat between the central bank and finance ministry spill into the open. It reveals cracks in the government’s façade of unity as a campaign to control debt exacts a toll on the economy. The disagreement started on July 13th when Xu Zhong, head of the central bank’s research department, spoke at a forum in Beijing. Officially, China is committed to a “proactive fiscal policy”, meaning that the government will spend to prop up growth. But Mr Xu argued that the finance ministry was not delivering what it had promised, thus making deleveraging more painful. China, he noted, is aiming for a 2.6% deficit in 2018, tighter than last year’s 3%. What’s more, many companies face rising taxes despite pledges of tax cuts. As evidence, he pointed out that fiscal revenues are growing more quickly than GDP (see chart). The finance ministry was “acting indecently”. Compared with politics in the West, that might sound rather mild. But for China, it was a harsh public rebuke. Mr Xu’s words spread quickly online. The rebuttal came on July 16th on the website of Caixin, a respected financial magazine, written under a pseudonym, Qingchi. The author claimed to be a finance official; the article’s detail lent credibility to that claim. Qingchi started with a clarification: focusing on the deficit is simplistic, because the government has other tools, such as the budgets of state-owned firms, to support growth. 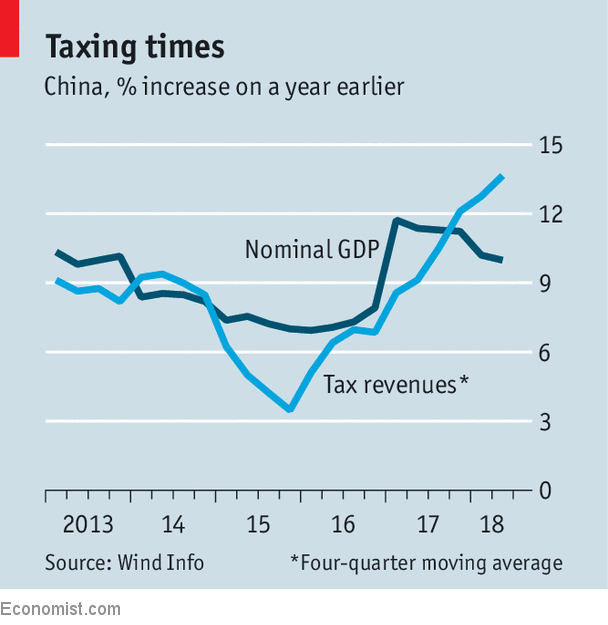 Fiscal policy is stronger and more co-ordinated, Qingchi asserted, than it used to be. It is not the first time that the central bank and the finance ministry have been at loggerheads. In 2007 the central bank lost a battle for Huijin, a vehicle that holds stakes in China’s main commercial lenders. The sovereign-wealth fund, under the finance ministry, took control. But that was a mere turf battle, and was waged behind closed doors. The dispute of the past week cuts to the heart of economic policy. Both authors said they were expressing personal opinions, but their articles underscored China’s conundrums. The economy has held up well, growing by 6.7% year on year in the second quarter. But decelerations in credit and investment suggest that a sharper slowdown lies ahead. The trade war with America only adds to the headwinds. The deleveraging campaign is also starting to claim more victims. China had a record number of bond defaults in the first half of the year. Stocks are in a bear market, down by more than 20% since January. No regulator wants to take the blame for this distress. Tough new asset-management rules have been delayed as a result. But at the same time no regulator wants to be seen as the one that gives up on the fight against debt. Better to pass the buck. Institutionally, the debate is intriguing. Neither the central bank nor the finance ministry is independent; each answers to the State Council, China’s cabinet. Larry Hu, an economist with Macquarie Securities, says the solution must come from a higher level. These days, that is a euphemism for Mr Xi and his senior advisers. One concern about Mr Xi is that he is stifling debate. In that respect, it might be seen as heartening for the central bank and the finance ministry to battle it out. But as the dispute breaks into the open it raises another fear—that internal channels have become blocked, at a delicate time.